I just got back from chasing goats in Montana last week. Rain and low goat count due to winterkill/rifle kill last year conspired to mess up the first part of the week, but Joseph's Chicken-fried buffalo steaks made up for it! By Wed evening the goats were hitting the water again and I sat 14 hours thursday and 6 hours friday on stand. Several nice bucks came to water out of range, and when this little guy walked past at 8 yards I figured why look a gift goat in the mouth and I took him. 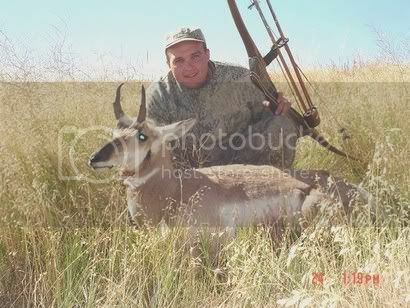 After 10 1/2 days over 2 years of DIY goat hunting he feels like a trophy pronghorn to me! Shot him with a 64lb Widow recurve, big Snuffers and Carbonwood 5000's (long story there). One lung, diaphragm, liver, he went a hundred yards or so, down in 8 seconds. Great story Ryan, congrats, I'd have liked to have had one of Josephs steaks! Headed for Kodiak Thursday morning for a 10 day Blacktail hunt. That a way Ryan. Goat hunting can be feast or famine. Spent more than a couple 14 hour days in a blind myself (4 on 1 hunt..it was brutal LOL). Congrats Ryan Way to go......Again! Hey Ryan after many hours, blown stalks and missed shots I gotta tell ya that any speedgoat with a bow is a trophy. Congrats! !